2) leave a comment on each Design Team blog including this Blog. What is the Blog Candy? OH, you are going to love this one... Each Viva Las Vegastamps! team member got this for the first month we were on the team and we all were so excited when we got it. So we are sharing our excitement with you. This is a $25 value and you will love it. 2) Stamped "Greeting from Las Vegas" onto cream cardstock using Black Ink. 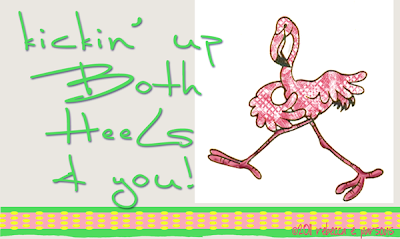 I colored in the image with my colored pencil, BUT I colored the Flamingo in with my Pink and Yellow Crystal Lacquer. I matted this image onto Pattern paper when onto Dark Brown Cardstock. 3) Stamped two of the 4 - 5 petal flower stamp onto white cardstock. Cut them out. I then stamped the swirl stamp onto the flower with clear embossing ink and Ultra High Gloss Clear Embossing Powder. I did a resist technique here (when you go to my blog, there will be a video on how to do this...) After I heat set my embossing powder, I added Pink dye ink over the whole image. The embossing powder will resist the ink I added over the flower. I aged the edges of my flower with brown chalk ink. 4) Continuing on my flowers - I added a Pink Silk flower to the center and then added an eyelet. I filled the center of the eyelet with Yellow Crystal Lacquer. Set aside to dry.. Here is a list of our hop - just in case you get lost along the way, you can stop by here and find yourself. remember you must leave us a comment and become a follower of all the blogs on this list... Hope you are the winner! Here is a video on "how to change the color of your Ultra High Gloss Embossing Powder from Viva Las Vegastamps!" Hello again! Welcome to my second blog post for the Viva Las Vegastamps! Design Team. Today, I just happen to be posting from my room at The Venetian hotel in Las Vegas. I am here with my partner who is here on business to speak at an HR conference (SHRM). 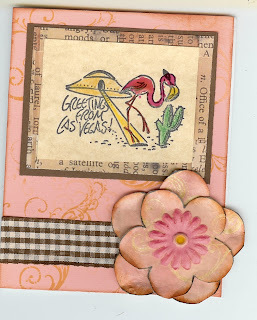 Tomorrow, I am planning to visit the Viva Las Vegastamps! store, where I am sure I will go into shopping overload. The temperature in Vegas today is about 104 degrees Fahrenheit, so a cool breeze would be nice. That thought brings us to my project, which, you could say, features a cool breeze. I used two Viva Las Vegastamps! stamps on this card; Blowing Wind Corner (6726) and Acrobat on Rope (17450). Blowing Wind Corner is a large corner stamp of clouds with a face blowing a gust of wind. Acrobat on Rope features a girl hanging on to a piece of rope. I stamped both stamps with Memento ink and then colored them with Copic markers. I took a fine tipped black marker and drew lines coming from the frayed end of the rope to make it look like the strings coming from a bunch of balloons. 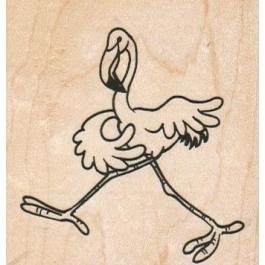 By doing this, I was able to use this stamp for something completely different than what it depicts. Then I punched some balloons out of different colored papers and covered them with Clear 3D Crystal Lacquer. I glued them down in layers, putting the balloons in the front of the bunch on pop dots to add dimension. After that, I decided to use a foam applicator sponge to put down some Broken China distress ink to make the sky look more realistic. I also added a little bit of Milled Lavender distress ink to the cloud stamp to highlight some of the areas that I had colored with the Copic markers. Be sure to come back here in just a few days because we are having our blog hop on the 29th and you can win great prizes! 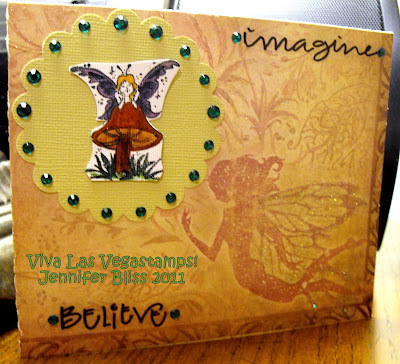 I have had this Fairy Paper for a while now and thought that the 1 3/4 X 2' Fairy On Mushroom Stamp from Viva Las Vegastamps! would work with it nicely. You can view that individual stamp HERE. I decided to use a combo of craft markers and pens including gel pens, CM Markers, and a few ZigZag/Bargain Bin ones. This paper is textured and has some sparkle to it but I wanted to add some more BLING to it too! I used Sticko Gems. The punch I used was Fiskars. Ever since I have been ordering from VLVS - I have been ordering the UNmounted stamps...because you can really stretch your dollar(s) much more by doing this! The more rubber stamps the merrier! They take up less room in my stamp drawers, too! More stamps...more storage space left over! LOVE IT! What's so important about the 29? VLVS is having a blog hop! You won't want to miss it and if you leave comments on each one of the DT Members blogs, you'll be entered to win some of your very own VLVS stamps! Please swing by my blog anytime! Today I'd like to share with you a technique I just recently learned via Tim Holtz's blog (from WAY in the past). It's all about creating a faux batik effect! To create our faux batik, emboss your stamp onto the tag with no ink or color. Make sure not to overheat the powder as we'll be removing it later! 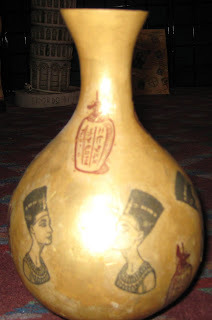 Once the embossed image is cooled, ink the base to your heart's desire.. I did all of the yellow and orange sponging, as well as the red splattering. Now here's where the magic happens.... Place a piece of newsprint (not glossy, but regular newspaper) over the tag and heat with an iron! Make sure the iron is on its hottest setting withOUT steam or water. you don't want to ruin any inking you've done! You should see the embossing powder soak into the newsprint.. and Viola!! Take off the newsprint to see your new image! You can always use a colored embossing ink to give your image some value, too. Stay tuned for the other designer's posts and make sure to keep your eye out for the blog hop!! I have some fun Alice in Wonderland themed party favors, and I'm sure everyone else has great stuff, too!! The 29th!! 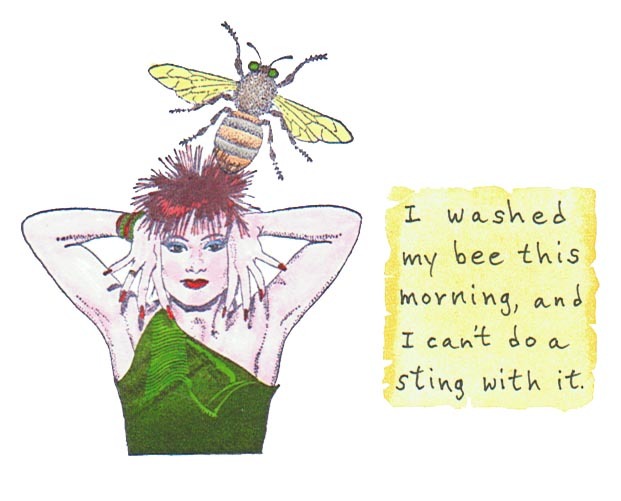 and if you leave comments on each blog, you'll be entered to win some of your very own VLVS stamps! P.S. don't forget VLVS! gives you the opportunity to order your stamps UNMOUNTED making them more than affordable! Did you do any stamping?? I'm not sure what you think but I think he is one cool moose!! He is stamped in black ink and colored with Bic markers. The mat around the picture was cut with the Cricut. Papers are from my scraps. I highly recommend the pound of rubber! I have a friend who loves Halloween and collects Halloween art and crafts. Her birthday is early July...I always do an art project for her every year. I am creating one to attach with a Miracle Sheet to the lid of a box!!! 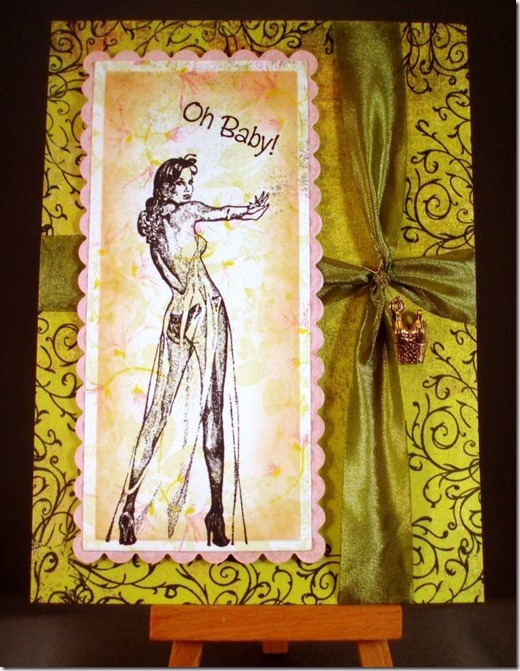 So I created this piece for her with three Viva Las Vegastamps! Thank you for stopping by today. This is a fun card I made for a fellow worker. Everyone got a kick out of it. I just love these women images from Viva Las Vegastamps! The main image is called Sheer Backing and can be found HERE. The image is stamped with Black Archival Ink, then the edges are distressed lightly. This card was put together using Miracle Tape, awesome stuff and can be found HERE. Have a wonderful day and stop by Viva Las Vegastamps! You will not be disappointed! One By One - My first blog post! Hello everyone! I’m Joe Morgan and this is my first blog post as a Viva Las Vegastamps! Design Team member. 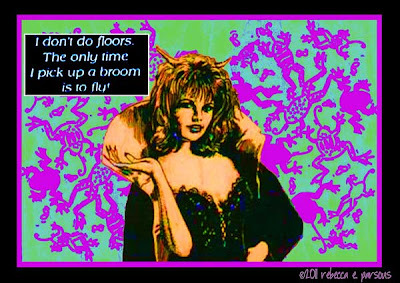 I have a strange sense of humor, as you will see in some of my postings. For this project I decided to make a card using three stamps from Viva Las Vegastamps! 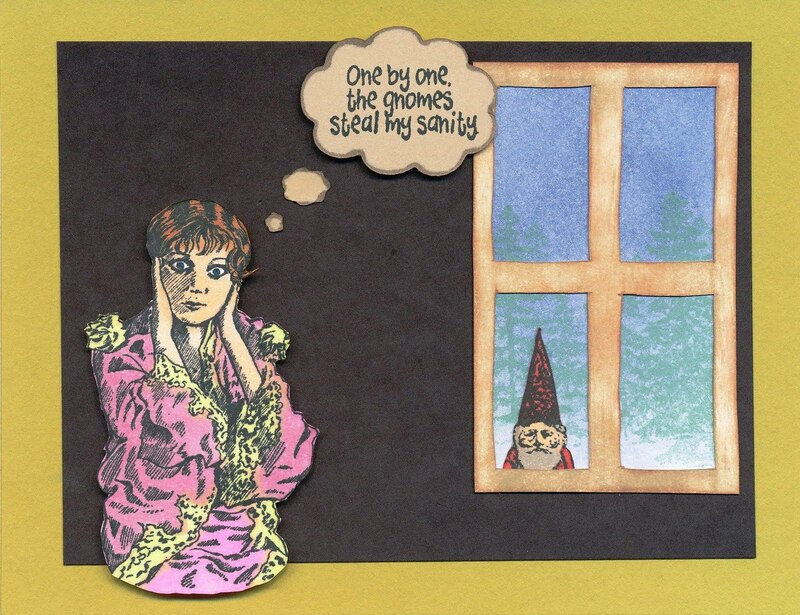 To start out, I stamped the crazy lady and the gnome on white cardstock with black Memento ink and colored them with Copic markers and then cut them out. I cut the window frame by hand with a razor and then inked it with a cat’s eye pad. I cut the thought bubbles with my electronic cutting machine. I used blue Distress Ink to color the piece that goes outside the window. After that, I just assembled the pieces as you see here in the finished card. The crazy lady and the large thought bubble are adhered with pop-dots for extra dimension. Here are the item numbers for the stamps I used, and they can all be found at the Viva Las Vegastamps! Online Store. I hope you like what I have shared today, please remember to keep checking back for more ideas. Feel free to visit my blog on the Create & Craft site and say hello by clicking here! Hello everyone! It's Jennifer - happy to once again be posting a project here on the VLVS DT Blog! Hope you are all having a great day! The week I did another card - but I will say this - I have been seeing a common denominator here lately with my card layouts unless I'm following a sketch. So today I really went way out in left field with this crazy card chaos! I've said it before and I'll say it again...I LOVE ASIAN THEMED CRAFTY PRODUCTS!!! So when I saw the Live Laugh Love 1 1/4 X 2 rubber stamp that VLVS had I HAD to get it! For the layout here I took patterned paper with Asian Symbols for my bottom layer. I then took an Asian Floral Printed Paper for my next layer and did a quick and easy mosaic with the cuts I made. After that I used my large punch with some adhesive paper and slapped it on for the next layer. I stamped (more on this in the next paragraph) the rubber stamp on some card stock and laid it down next. After that I added stickles around the edge and 3 large 3-D stickers on top along with some gems. I know it's a little busy but "mission accomplished" for me thinking outside of my comfort zone on the layout of the card! I actually used a clear ink pigment pad to stamp the image and sprinkled some "pearls" powder over top and took a soft print brush to it to gently brush away the loose powder. It worked like a charm! The powder stuck quite nicely to the pigment! So there you have it...a crazy card from me this week! Swing by and visit my blog HERE and remember to shop at Stampo.com! Until next time! 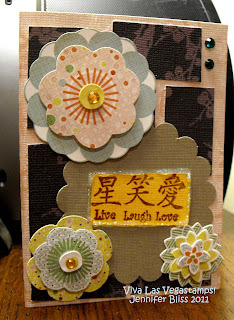 The Frugal Stamper's fun card! 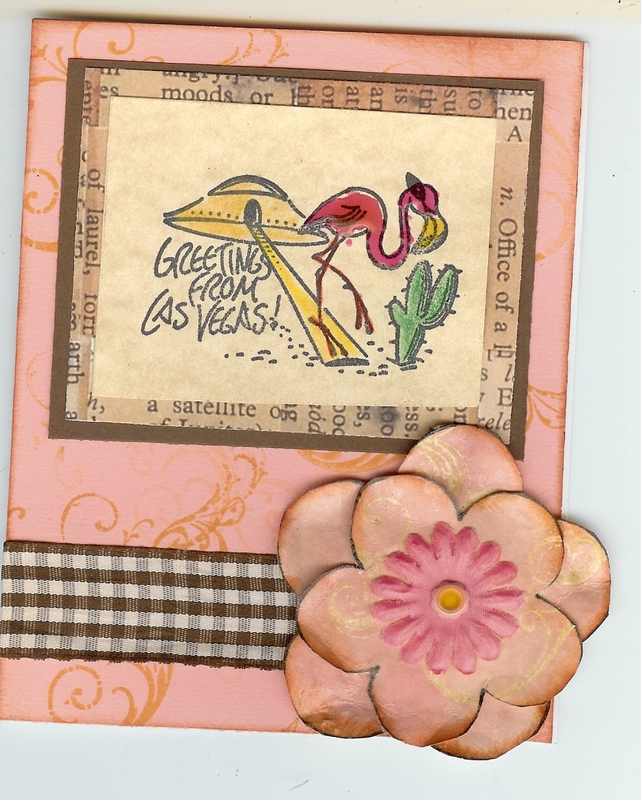 Lindsay has done a fun posting on her blog with stamps from her Viva Las Vegastamps! Pound O' Rubber... she has a unique and inexpensive way to mount the unmounted stamps and also creates wonderful cards with them! Hiya Folks!! DeeDee here again! This will be your 2nd helping of Halloweenie goodness from VLVS this week! Wayne (our powerful great head of VLVS) has asked us DT members to help out with an ad in the upcoming Halloween issue of Rubber Stamp Madness, hence all the Halloween treasures! Here's what I put together for the ad! Both use really similar techniques with slight variations in color and supplies! I started with manilla tags for both cards... using my craft mat I smeared the desired color of distress ink and spritzed with water. Then I ran the tag over the diluted water applying pressure so that the tag grabbed the color. When the tag was still damp but not soaking I ran the ink pad over it to add a bit more color definition in places. Spritz with water again and allow to dry! Then I stamped both images in a permanent ink pad - Memento in tuxedo black - available at VLVS. I trimmed and cut and adorned cards with new colored images! Don't forget about the wonderful blog hop coming up on the 29th where you'll get an extra project by each member, and a chance @ a pound o' rubber... a HUGE package of unmounted red rubber stamps! each of the DT members has received this.. and we've all LOVED it!! Plus say Hi to JOE!! the newest member joining our team!! HIIII JOE! and don't forget to check back all the time to see what everyone has to show you, such great work comin' from this team! Hello and thanks for stopping by today!! I know it's a little early for Halloween but it is my favorite holiday!! So why not start my Halloween cards early!!! I was so excited to see this stamp with a dog on the broom!! I'm totally a dog person so this is perfect!! You need to make sure you head over to Viva Las Vegastamps web site. They have more stamps than you could ever use!! Let me tell you the pound of rubber is the best thing ever. I have bought 4 of them and have only gotten 1 stamp twice! AMAZING!!! Oh and hey, if you head over there and buy something tell them Chris sent you. You won't get anything special, I just want to see if anyone will say "Chris sent me!" If they tell me you said "Chris sent me!" on your order I will send you a little something! I love to think out of the box with a product and come up with an idea that just a little different.. Viva Las Vegastamps! has a wonderful Ultra High Gloss Clear Embossing Powder that is just too much fun to play with. well I hope you enjoy that idea, if so, check out my other video on my Youtube channel including lots more using Viva Las Vegastamps! I have the pleasure of introducing a new member to our Design Team here at Viva Las Vegastamps! Cheryl Lindsay has left our team and we will miss her amazing projects and wish her all the best. Please welcome Joe Morgan to our team - he will fit right in with the team we have - his work is very creative. Please welcome him - you will see his first project on June 13th. Please stop back by then and welcome him. But remember our team posts a new project on this blog on Monday, Wednesday, and Fridays! Also Our Design team is having a Blog Hop with Blog Candy on June 29th... DON'T MISS THIS! Here is Joe Morgan's Bio and Link to his Blog. items – like garden lanterns with paper silhouettes and an antique finish. After living all across the US, Joe has settled in Columbus, OH with his partner. 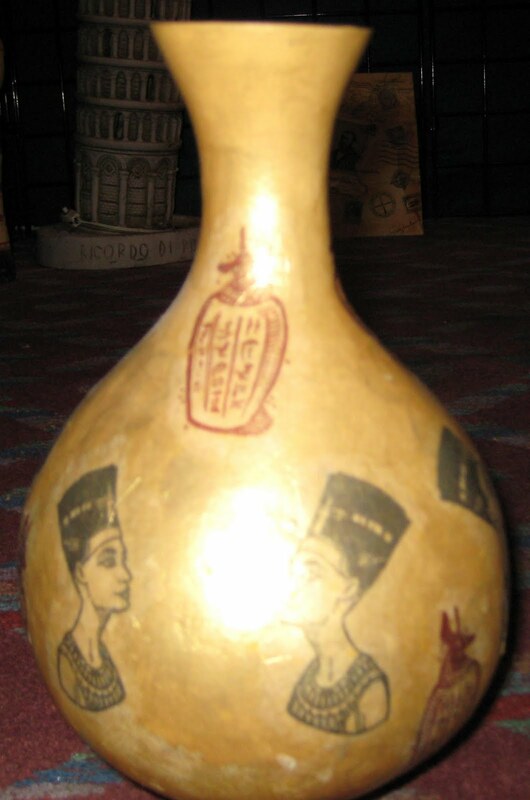 new class ideas and teaching occasional classes at stores or exhibitions. Thanks for stopping by - remember to visit our on-line store for all your stamping needs. I used a combination of paint brushes and erasers to color the bird after I stamped it on a white piece of paper and scanned it into PhotoShop.